Glacier Raft Company, Golden, BC, Canada. 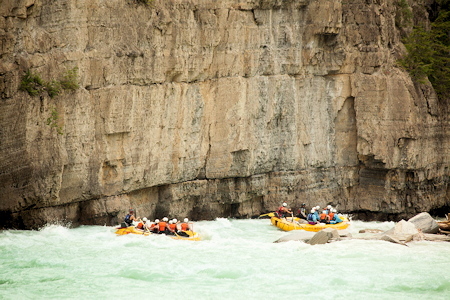 White Water Rafting Trips on the Kicking Horse River. Inflatable Kayak Tours & Rentals. 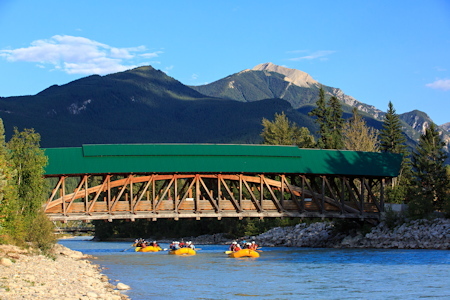 For 35 years Glacier Raft Company has been providing white water rafting trips on the Kicking Horse River, and other beautiful rivers around Golden, in the East Kootenays region of British Columbia, Canada. 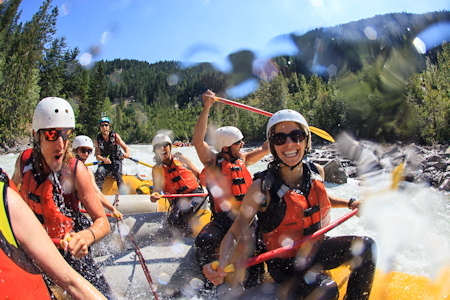 We offer white water rafting trips and inflatable kayak tours and rentals from mid-May to mid-September. Trips depart daily at 10:00 a.m. and 12:30 p.m.
and we want to share it with you! 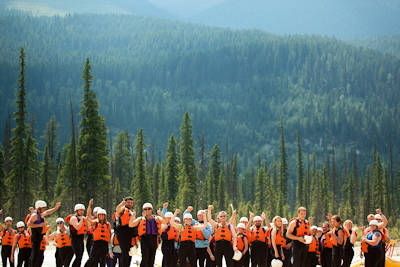 That's why people love Glacier Raft Company; because we love what we do. 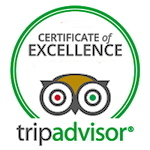 Our guests comment all the time that the positive energy of our staff made their day that much more enjoyable. We focus on all the details - big and small - to make sure you have the best day possible. We want to surpass your expectations. 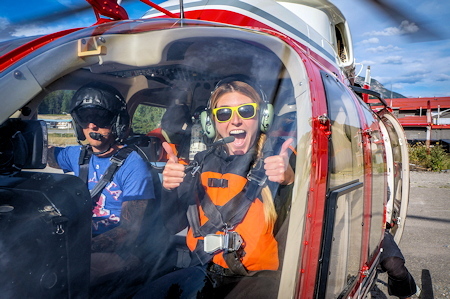 Are you ready to live an adventure? #1 Attraction in Golden for 8 years and counting! Are you looking for boat swamping rapids, a sit back and relax kind of float, or maybe a bit of both? We have what you need. 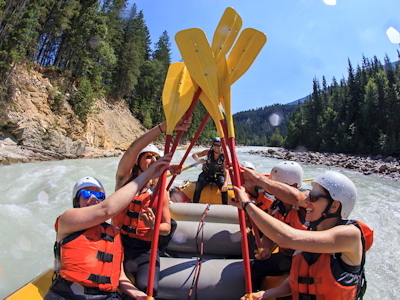 The Kicking Horse River is divided into 3 sections - the upper, middle and lower canyons - so whether you want to be digging in hard, or barely paddling at all, we can tailor your Kicking Horse River rafting trip to what suits you best. 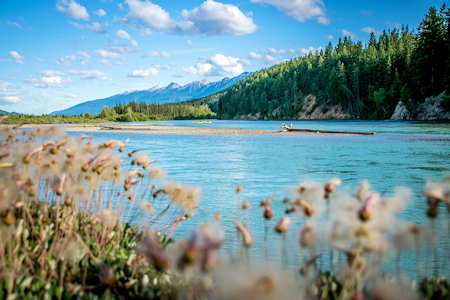 We offer 5 different trips on the Kicking Horse River and would love to help you pick your perfect experience. 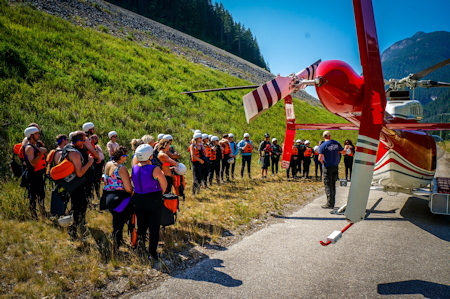 The Ultimate Heli Adventure is the most complete rafting experience on the Kicking Horse, as it's the only trip that rafts all 3 sections of the river. It starts out with the calmer upper canyon and builds into the big class 3 and class 4 whitewater of the middle and lower canyons. 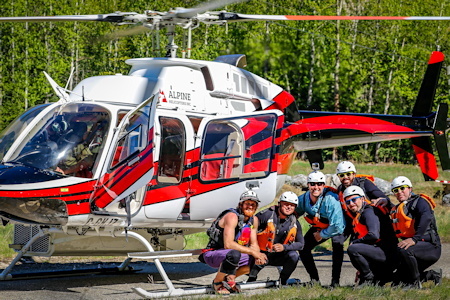 The lower canyon is only accessible by helicopter, so if you want a full day of non-stop adventure, this is the trip for you! This trip includes our riverside barbeque lunch and it runs from 10:00 a.m. - 6:30 p.m. The cost is $299 per person plus tax. You can see more information on this specific trip by clicking HERE to head to our website. Pure Heli White Water rafts the two biggest sections of white water on the Kicking Horse River - the middle and lower canyons. 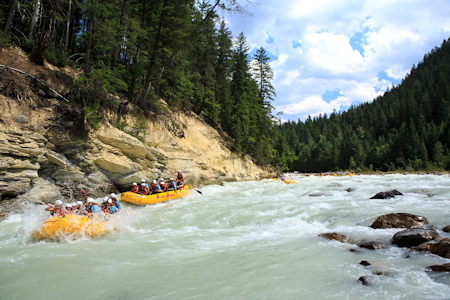 There are lots of continuous class 3 and 4 rapids, and the lower canyon is only accessible by helicopter. If you only want big adventure this is a great choice. This trip starts after lunch and it runs from 12:30 p.m. - 6:30 p.m. The cost is $269 per person plus tax. 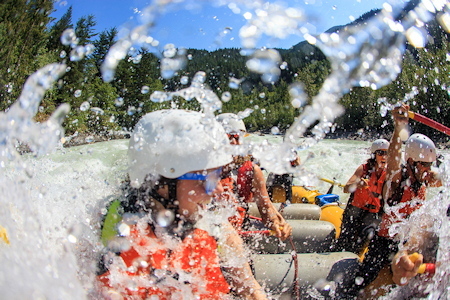 The White Water Discovery is our most popular trip. It starts off with the calmer upper canyon works up to the fun class 3 and 4 white water in the middle canyon. It is a full day on the river and is a great balance between a beautiful float and great rapids. This trip includes our riverside barbeque lunch and it runs from 10:00 a.m. - 3:30 p.m. The cost is $149 per person plus tax. 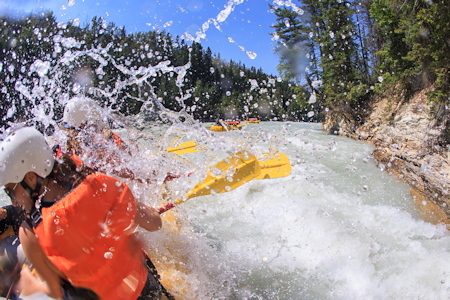 White Water Express is our quickest trip and it rafts the middle canyon of the Kicking Horse River. 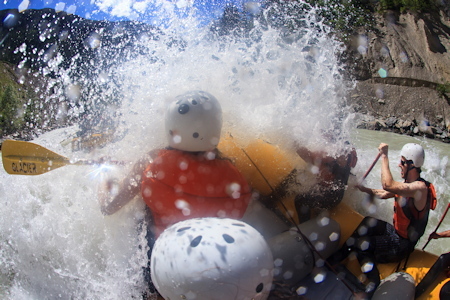 The middle canyon has a lot of fun class 2 - 4 rapids, and it starts off with an amazing 1 km stretch of continuous class 4 whitewater. If you're short on time or just want a quick fix of excitement, this is a great choice. This trip starts after lunch and it runs from 12:30 p.m. - 3:30 p.m. The cost is $99 per person plus tax. 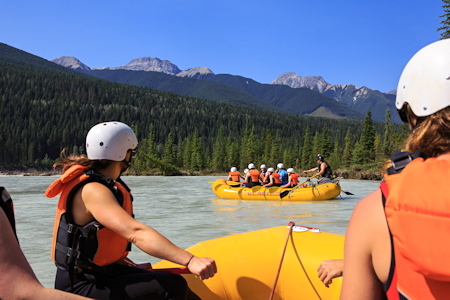 The Family Adventure rafts the upper canyon, which is the calmest section of the Kicking Horse River. It's predominantly a float with a couple of rapids near the end. It's our morning trip and it's a great introduction for those nervous about whitewater rafting, or for families with young children. This trip includes our riverside barbeque lunch and it runs from 10:00 a.m. - 2:30 p.m. The cost is $89/Adult and $59/Child (12 and under) plus tax. 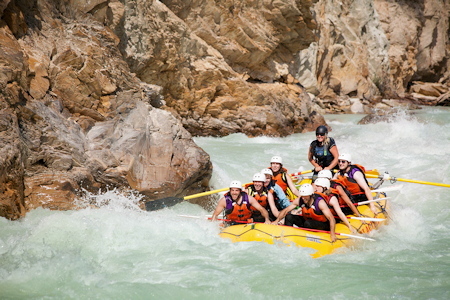 None of our trips require prior rafting experience. You'll be out with a very experienced guide and they'll let you know exactly what you need to do. Too much information and not sure what's best for you or your group? Please get in touch - we'd love to help!